This time last week we were packing our overnight bags to take advantage of a Mallorca residents’ deal on offer this month from Castell Son Claret – the country house hotel that opened in the spring of last year, with the marketing strapline ‘The Luxury of Silence’. The hotel has two restaurants – Zaranda (which went from one star to two Michelin stars for 2016 and 2017) and Olivera. Both are overseen by award-winning chef Fernando Pérez Arellano, whose Zaranda restaurant was originally in Madrid, before he (and his entire team) moved to Mallorca (initially to the Hilton, and in 2013 here). I’ve been eating out a lot since Christmas and didn’t think I could manage one of Zaranda’s tasting menus, so we decided to try Olivera. I told myself I’d have just two courses. I don’t think I was listening . . . It didn’t help that this hotel has its own in-house bakery and baker, which meant that the basket of several types of bread was irresistible. The bread came with olive oil, olives, alioli and some extremely moreish seasoned almonds. There was also a small amuse-bouche (not counted as one of my two courses). The à la carte menu offers a real variety of starters. For those on a really indulgent splurge, there are Gillardeau oysters and 1er cru Oscietra caviar ‘Perlita’ (if you need to know the price, they’re not for you). But you don’t need to mortgage the house to eat in Olivera – although you should expect to pay a little more (especially for wines – and it’s a great list) because of the luxurious and rather beautiful setting of the hotel and high quality of the food and service. And so to start . . . 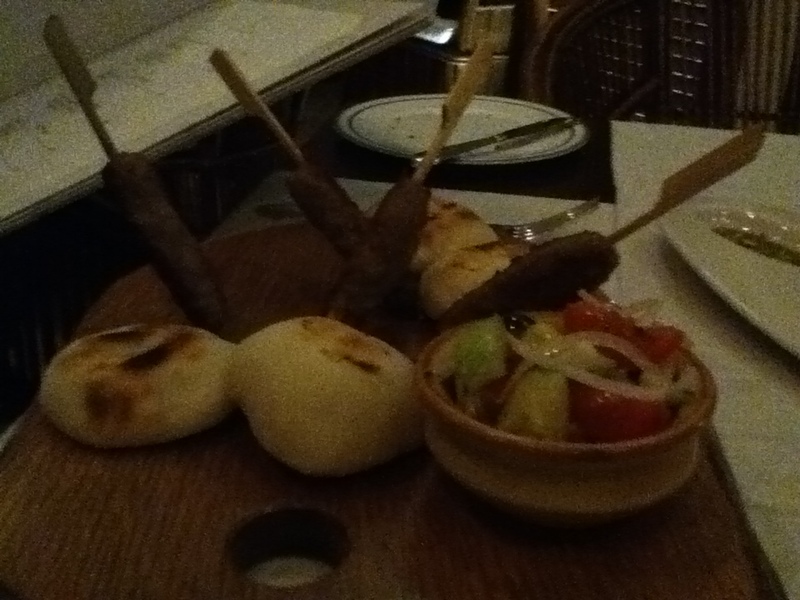 The Boss chose lamb keftas with tzatziki, chickpea hummus and pitta bread (18€); I had roasted scallops and pancetta brochette with green lentil and cumin salad (19€). 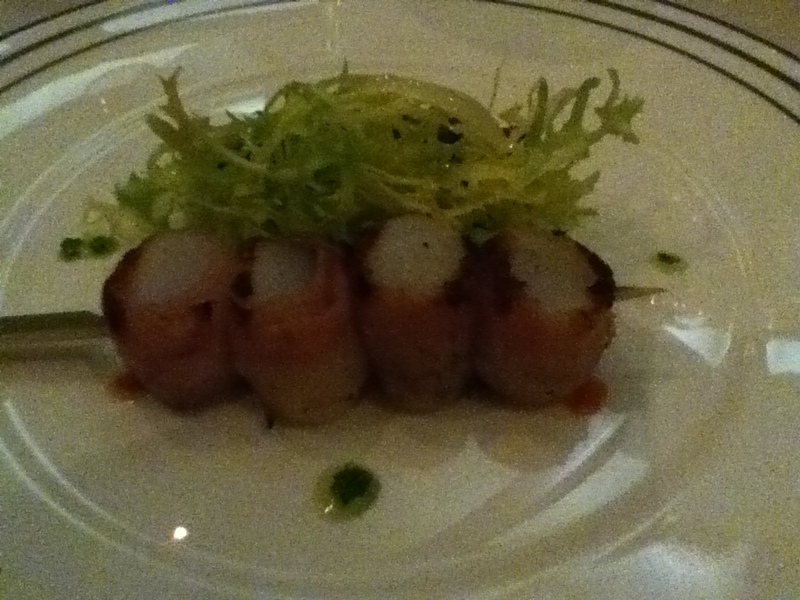 The scallops were perfectly cooked and the accompanying salad very good. Appreciative words about the lamb came from across the table. Meat, fish, veggie, or homemade pasta? We were tempted by the Moroccan-style slow-roasted shoulder of spring lamb with spiced couscous (46€ for two to share), but The Boss finally decided on fondant of braised venison and foie gras with chestnuts and cranberries (23€) and I had smoky-glazed Wagyu beef rib with ‘patatas bravas’. It was the first time I’d eaten Wagyu beef (I’m usually a fish girl), and it was tender and deliciously flavoured. Pud would be good . . . The restaurant’s star dessert appears to be cream of goat’s cheese with basil and strawberry and red wine sorbet (sounds good). 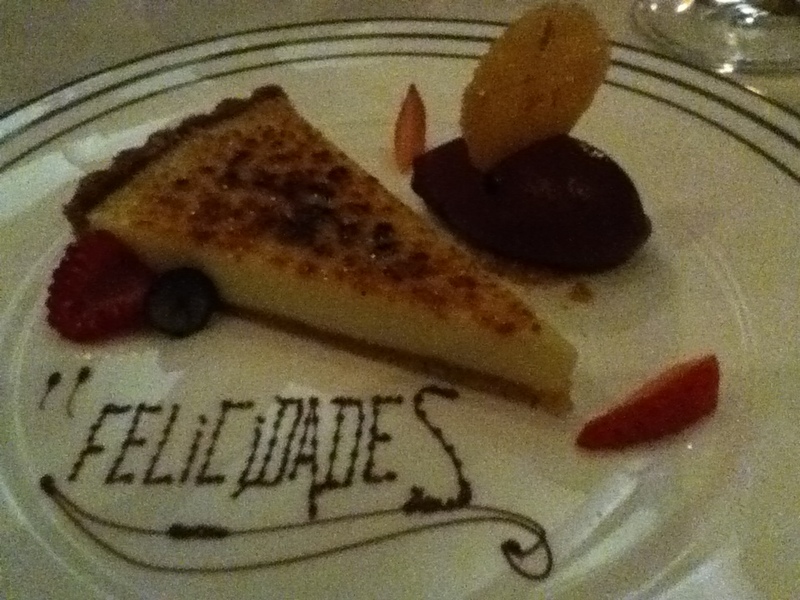 But having seen members of staff carrying baskets of lemons from the orchard into the hotel earlier that day, the Boss succumbed to the lemon tarte with blueberries and, on the recommendation of the charming restaurant manager Itziar Rodríguez, I had the caramelized apple tart (a very good choice). So much for the plan to have only two courses . . .
Last Friday night every table was taken and some of the diners were clearly not staying in the hotel. If you visit and don’t stay overnight, you’ll be offered a lift back down to the car park in one of the hotel’s zippy little buggies. A fun way to end the evening . . .
Prices were correct at time of writing.